These might sound like the words of Los Angeles’ 42nd Mayor, Eric Garcetti, who was elected to office in May 2013 with a “Back to Basics” agenda focused on “strengthening our economy and making City Hall more efficient and effective.” But they were actually uttered in 1974 by L.A.’s 38th Mayor, Tom Bradley, following a City Council vote to ban sidewalk vending throughout the city. Above: Tom Bradley (left), L.A.’s 38th Mayor serving from 1973-1993, and Eric Garcetti (right), L.A.’s 42nd Mayor, elected May 2013. Something Garrcetti did say, in an interview with Los Angeles Magazine, is that “Kids these days don’t want cars. 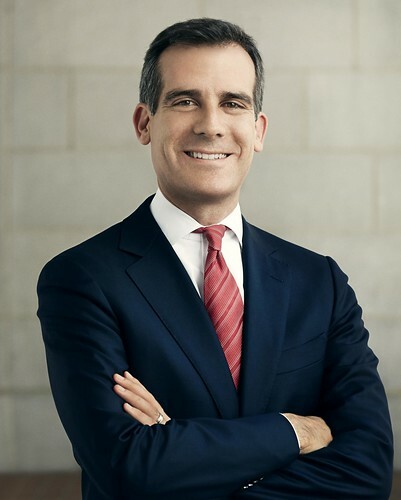 Bikes and public transportation are already part of their culture.” He’s also purported to have proclaimed on his first full day in office that Los Angeles was beginning to leave behind its culture of car ownership (see Where Car Is King, Smartphones May Cut Traffic, Ian Lovett, NYT). What does a possible transformation of Los Angeles’ streets and its car culture have to do with the street vendors who push carts of cut fruit, flowers, and other goods through the interstices of the urban landscape? Mark Vallianatos, author of the Incomplete Streets chapter titled “Compl(eat)ing the Streets: Legalizing Sidewalk Food Vending in Los Angeles” and a recent LA Times op-ed oped, Legalize L.A. street vendors, offers a possible answer. According to Vallianatos, street vendors serve important functions, like increasing food choices in food deserts and enlivening otherwise dead or underutilized public spaces. Los Angeles, or any city that embraces streets as public spaces that function to do more than simply move automobiles, will have to confront the tricky question of who will be allowed use of these spaces and for what purposes. Cut fruit cart in West Los Angeles. Are streets incomplete when street vendors are banned? Laws and street design pushed walkers off of streets and onto the sidewalks and redoubled efforts to keep sidewalks clear as unobstructed routes for pedestrians rather than as places to gather…Without commerce, entertainment, and political attractions to draw and keep residents onto sidewalks, pedestrian activity in most parts of Los Angeles withered away, leaving streets with few people. In a self-fulfilling prophecy, Los Angeles created a car culture by taking away the rights of citizens to practice other cultures on the streets. Limits to street vending in L.A. were first imposed on downtown sidewalks in the 1930s. 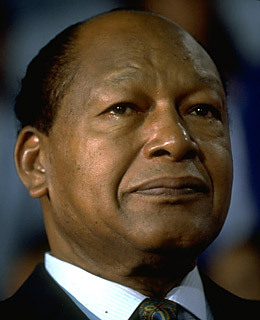 It wasn’t until 1980 that vending was banned on all of L.A.’s sidewalks, despite the efforts a few years earlier of Mayor Tom Bradley to prevent a ban. From restrictions on Chinese laundries to racially restrictive property covenants, governmental and private land use controls in the city were long tinged by racist assumptions. Although attitudes are changing, sidewalk vending has been viewed as a foreign, chaotic activity—a third world occupation—rather than as an opportunity to encourage business formation, make pedestrian-friendly streets and provide food in low-income areas. Vallianatos’ analysis of the evolution of street vending in L.A. reveals a similar practice. For many of L.A.’s immigrants, street vending is not only a normative cultural practice, it is also a viable and even essential economic practice. Whether there are racial undertones or not, a street vending ban functions to validate certain economic activities (e.g., formal economic activity) in certain places (e.g., brick and mortar stores), while stigmatizing others (e.g., informal economic activity in the streets). Which begs the question, for whom are streets being “completed” when cities undertake Complete Streets initiatives? Is there a place for street vendors in L.A.’s Complete Streets future? Great Streets provide gathering places to meet, to shop, and to spend time with friends and family. Great Streets give Angelenos more affordable and convenient access to jobs and amenities that are easily accessible whether on foot, bike, transit, or in a car. A prosperous city needs Great Streets, and Great Streets are coming to Los Angeles. This strategic plan serves as a road map for LADOT to improve pedestrian safety, enhance mobility for those on buses and bikes, relieve congestion and parking woes, and enhance the efficiency of freight movement in LA. Making our streets safer, more livable, and more sustainable will lead to greater economic vitality for Los Angeles as a whole. Street food helps make streets and sidewalks in Los Angeles more ‘complete’ places by expanding and blurring formal categories of route and place, cuisine and culture, sale and purchase, law and politics. From tacos or bacon-wrapped hotdogs after a night out to a stop at a cut fruit cart on a hot afternoon, carts and trucks extend the hours and places that people buy, sell and eat. These mobile meals create hotspots of social interactions in a city that too often lacks public life. As the City of Los Angeles attempts to reshape its roads and transportation system to incorporate more Complete Streets that are safe for pedestrians, bike riders, transit users, and drivers, it will need to reexamine whether there is a role for food vendors, with their distinct cultural signifiers and spatial practices, on city sidewalks. Can streets in a heavily immigrant metropolis, however multi-modal the distribution of lane space, be said to be “complete” if they fail to include the livelihoods and economic survival of vendors; the smells, sights and tastes of homelands; and places for people to pause, shop, and eat? A street vending program to “Compl(eat) the Streets”? Fortunately, a vision of streets that includes L.A.’s estimated 50,000 street vendors may be converging with Garcetti’s Great Streets vision. After several years of advocacy by a coalition of more than 40 organizations, the Los Angeles City Council’s Economic and Development Committee unanimously passed a motion in 2013 to begin research that would lead to a comprehensive street vending program that would address enforcement measures, operational budget, revenue projections, vendor fees and options to encourage healthy food vending. A year later, the City’s Chief Legislative Analyst, in consultation with the Department of Public Works, Bureau of Street Services, the Los Angeles Police Department, the Economic and Workforce Development Department, and the Los Angeles County Department of Public Health, submitted a proposed sidewalk vending framework to the Economic and Development Committee. On Dec. 2 the Economic and Development Committee approved the recommendations in the Chief Legislative Analyst’s report. with sister agencies such as the Bureau of Street Services, other Bureaus within the Department of Public Works, Department of City Planning and Department of Public Health, among others. Interagency coordination is probably one of the more surmountable challenges. More difficult challenges will include overcoming institutional inertia, confronting power relations that protect and preserve the status quo, and creating opportunities for authentic democratic participation not just in policymaking processes but also in the very act of reimagining what streets are for and who belongs on them. If we don’t face these challenges head on, Great Streets will remain incomplete streets.